This brochure contains menus for low-cost balanced diets and for school-lunch programmes. It is meant to be used along with an earlier publication of these Laboratories 'The Nutritive Value of Indian Foods' by Gopalan, Ramasastri and Balasubramanian. The publication concerned itself with the nutritive values of several Indian foods and the broad outlines for planning satisfactory balanced diets. The present effort goes a step further and suggests menus and actual recipes which would indicate the practical ways and means of devising cheap balanced diets. Since a considerable portion of the information gathered by these Laboratories regarding dietary practices pertain to South India, it is but natural that this attempt is confined, in the first instance, towards suggesting menus suitable for South India. Menus suitable for other regions may be expected to follow. The brochure is divided into two parts. Menus and recipes suitable for adoption at home are dealt with in Part I, while menus suitable for mid-day meal programmes for children in schools are dealt with in Part II. In the formulation of low-cost balanced diets, an attempt has been made to suggest menus which would be within the economic reach of the poor. These menus may not be considered to have fully met the ideal nutrition requirements of a balanced diet but have the merit of practical feasibility in the prevailing economic conditions. In suggesting menus for school-lunch programmes, an attempt has been made to include menus based on non-rice cereals and protein- rich foods. The objective of a school-lunch programme should be not merely to satisfy hunger but also to offset gross deficiencies in the home dietaries of children and to inculcate proper dietary habits. These objectives have been borne in the formulation of the menus for school- lunch programme. 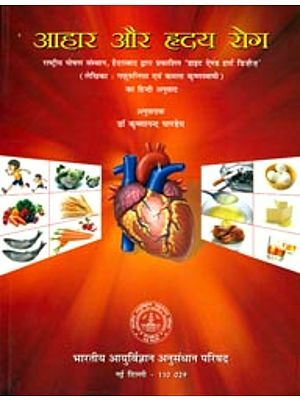 It is realised that within the small compass of this brochure, it is not possible to anticipate the diverse problems connected with the provision of balanced diets in homes and schools or to answer the practical questions which the housewife or the practical nutritionist may be confronted with. Constructive criticisms and suggestions aimed at improving the brochure will always be welcome. The following members of the staff of the Nutrition Research Laboratories have helped me in the preparation of the brochure: Dr. S. C. Balasubramanian, Dr. B. S. Narasinga Rao and Miss Swaran Pasricha. 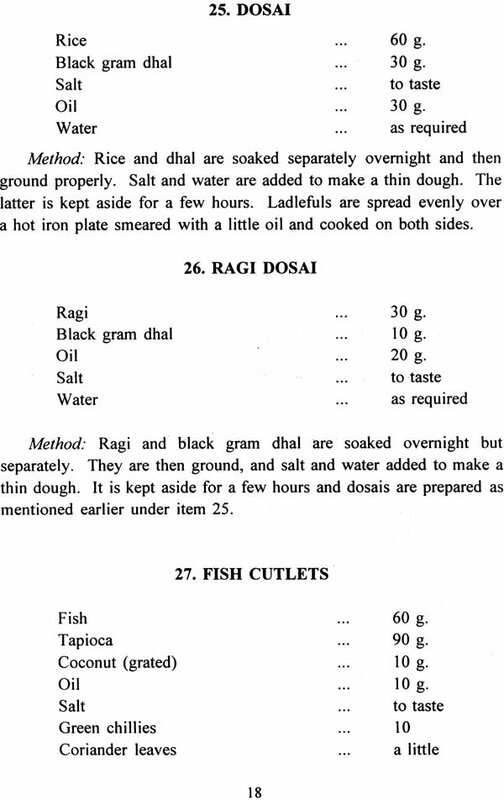 It is gratifying to note that this handbook entitled "Menus for Low-Cost Balanced Diets and School Lunch Programmes (Suitable for South India)", first published in 1958, has been revised and reprinted several times since then. In the present edition, a few easy-to-make low- cost snacks have been included in place of some cumbersome preparations. In the earlier editions, information on approximate cost of mid- day meals and snacks was provided. However, in view of considerable variation in the cost of foods from place to place and continuous escalation of prices of foods, this information was found to be of little practical use. It has therefore been deleted in the present edition. With the Government of India deciding to extend the coverage of mid-day meal programme to the entire country, it is hoped that this book would be found much more useful in formulating mid-day meals and also in supplementary feeding programmes. Investigations carried out in the last few decades have provided information on human nutritional requirements. With this information, it is possible now to indicate what a balanced diet for a normal human being should be. To enable the public to prepare such diets in their homes, it is considered essential to suggest daily menus. The Nutrition Expert Group of the Indian Council of Medical Research has recommended certain dietary allowances for balanced diets. However, diet surveys in different parts of the country have shown that the content of different nutrients in Indian diets is considerably lower than the recommended levels. An attempt has, therefore, been made here to suggest nutritious low-cost menus within the economic- means of the majority of the people. The menus suggested are meant mainly for the lower income groups of people. Modifications in these menus needed to bring them into closer conformity with the recommendations for the ideal diet have also been indicated at the end of this section. These modifications will naturally put up the cost of the dietaries. However, for the higher income groups who can afford the increased cost, these modified menus are recommended. As a result of extensive diet surveys, considerable information on the dietary pattern and practices of the population has been collected. In suggesting menus, care has been taken to include mainly foods which are in common use in the locality and which are, therefore, not 'foreign' to the people. The recipes suggested are again generally based on the prevalent cooking practices in the community. It is, therefore, expected that the popularisation of these menus will not involve drastic changes in the dietary habits of the people and will, therefore, not encounter significant psychological 'resistance'. This would mean that the propaganda and nutrition education required will be minimal. While rice is the major staple cereal of a considerable part of the South, an attempt has been made here to replace a part of the rice, preferably half of it, with wheat, millets and tubers. Recent researches have shown that such combinations apart from lessening the demand on rice, may also be beneficial from the nutritional stand-point. Different preparations based on wheat, millet and tapioca have also been suggested with a view to popularising the consumption of these foods among the predominantly rice-eating South Indian communities. Emphasis has also been laid on the need for the inclusion of foods other than cereals like pulses, fish, vegetables and fruits. 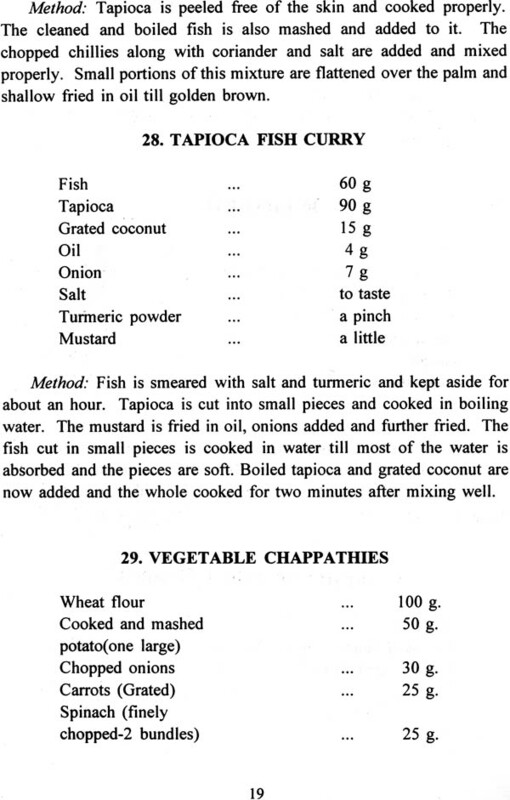 It is further recommended that generous amounts of fish or pulses should be taken whenever tapioca forms the staple food. Since these menus are mainly meant for the low income group, they have been so framed that the number of courses per meal is minimal and the cooking procedures are simple. In addition, a number of alternatives in the exchange lists are provided so that there will be no monotony in the diets and there will be reasonable variety. The menus suggested are for an adult and are based on 425 g cereals, 70 g pulses or fish, 100 g of leafy vegetables, 75 g of other vegetables, 30 g of oil, 30 g sugar or jaggery, 115 g of milk and about 30 g of fruits per day. The calorific value will work out to about 2400 with a protein intake of about 60-70 g per day. All other nutrients will be supplied in reasonable amounts to satisfy at least the minimal requirements. However, diets suggested here are not necessarily the ideal for the community. They could be considered to be the nutritious low-cost diets possible under the prevalent socio-economic conditions. For persons who can afford the extra cost daily one egg can be included. In addition, intake of milk can be increased from 115 ml to 200 ml for vegetarians and about 30 g meat or fish can be included for non-vegetarians. These will provide variety and avoid monotony in the diet.